We’ve perfected the art of importing and exporting prestige cars around the world. We’re more than happy to lend your our expertise to clarify any questions you might have about the entire process in the guide below. What Is Your Track Record in Importing and Exporting Prestige Cars? Unlike trade dealers, our company has established a relationship among the leading car manufacturers around the world. Along with our stellar credibility and reputation in the industry, our relationship with manufacturing companies has allowed us to provide you with the most competitive and convenient services possible. Over the years, our company has fulfilled importing and exporting requests to clients around the globe. Our customers are constantly surprised by how we innovate and improve our services to better provide their needs. Our dedication to superb car importing and exporting services has enabled us to build an impressive track record in the industry. Where can I Send My Inquiries and Requests? If you want to export a car to your region, you can simply browse our gallery and send us an email along with the details of the car you want to purchase. For other concerns, you may also reach out to our customer support team through the contact form on our website. How Fast Can You Deliver My Car? We pride ourselves in providing the fastest turnaround time when it comes to delivery. Cars that are available on stock may be delivered quicker compared to newly built cars. That said, delivery time varies from region to region. For a more accurate quotation of delivery time, we urge you to get in touch with one of our car export specialist today. Which Countries Can You Export To? Currently, we export to China, Africa, Singapore, Thailand, Indonesia, Malaysia, Hong Kong, South Korea, Australia, New Zealand, South Africa, India and most countries in Central Europe. Where Can I Reach You for Further Questions? Our car export specialists will be more than happy to answer your questions and fulfill your requests. 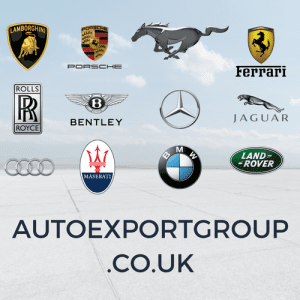 Simply send an email to info@autoexportgroup.co.uk or reach out to us through our dedicated contact form. Drive around in style or deck your showroom with the latest super car everyone’s been wanting through our car export services. Talk to us today so we can send you a comprehensive quotation on export and associated freight costs for your dream car.